As part of our balanced approach to fertility, growth, meat yield and worms we measure every trait from every animal to improve accuracy. Breeding High performance, Low input sheep. To keep one step ahead we are helping Agresearch with the Ewe Efficiency study, Dag and Flystrike study and the CARLA saliva study (to reduce impact of worms). MAKE THE MOVE - use ORARI GORGE Pure Romney or RomTex Genetics this year! We breed Orari Gorge Romneys to perform and to last in commercial conditions and to put more money in your pocket. Buying superior rams is one of the fastest ways to improve your bottom line. Orari Gorge Romneys are bred in the South Island foot hills for South Island commercial farmers. They will produce efficient, easy care ewes with good mothering ability and high performance. Only the top 30% of ram lambs born are offered for sale. Each ram is individually inspected three or four times for structure, conformation and type before they make it to sale. We use a raised race which allows us to clearly see their feet and pasterns. There is no quick fix to breeding the best sheep; our philosophy is to focus evenly on all the important production and health traits and to keep improving them all each year. • 68kg MA Ewes scanning over 200% and 60kg 2th scanning 190%. 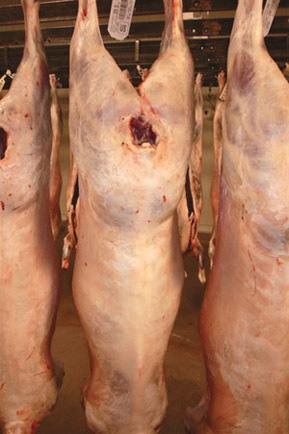 • Growth rates of 500g/d in undrenched stud ram lambs. • Muscle scanning for 15 years and now CT scanning. • Selection for resilience and resistance to worms and selecting against dags. As a participant in an AgResearch Ewe Efficiency study all our stud ewes are individually weighed and body condition scored four times each year. This data is then analysed with their individual lamb production. Our stud ewes (including 2ths) are wintered on the tussock hill country with no supplements. Recording which ewes do or don’t loose condition in this period and whether they bounce back or not is vital to the long term sustainability of our operation. Our commercial Romney ewes are run on these hill blocks (up to 3,000ft) all year round including mating and through the winter with no supplements and are then set stocked on the same blocks for lambing. They scan 175% not including triplets with only 2% dry. Our stud ewe lambs are run with the commercial replacement ewe lambs in one mob of up to 2,000 from weaning right through to 2th mating often on this hill country. Research has proven that the only way to beat drench resistance is to select for both resilience and resistance to worms. We are the only stud in the Country (of any breed) to be recording both of these with SIL. All ram lambs are grazed in one mob post weaning. Individual FEC are taken and regular individual weight gains are recorded to compare with control (drenched) lambs. We are assisting AgResearch with their Carla™ saliva research. We have tested all our replacement ewe hoggets and will test them again as 2th and 4th and also test all their progeny each year. For the next three years we will be measuring resistance, resilience and Carla™ for all our ram hoggets. Visit www.carlasalivatest.com for more information. As the main processors start to reward well muscled carcasses we are well placed as we have been muscle scanning and selecting for it in our index for 15 years. Last year we also started to CT scan our ram hoggets and this year completed a full progeny trial to follow the progeny of our stud sires through to slaughter to accurately measure carcass traits. We carefully selected top stud Texel rams from long term Texel breeders who have paid attention to the feet and wool as well as the growth and meat. We then mated these to our most fertile stud Romney ewes and the progeny have been through the same testing and selection criteria as our pure Romney rams. These will be ideal for injecting some Hybrid Vigour and extra meat yield into any maternal flock. - David Morrow, long term client from Mt. 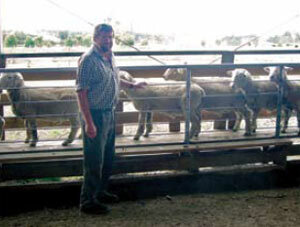 Somers, averages over 150% lambs weaned per ewe mated and was PPCS livestock farmer of the year 2005, and is regularly one of Canterbury Meat Packers’ top lamb breeder suppliers. As well as our own high standards the rams are also examined by a vet. We are 100% happy with the rams we sell but if they fail to do their job or become structurally unsound within 12 months we will give a full refund or offer a replacement. Last year each stud Orari Gorge Romney ram, as well as being mated to stud ewes was also mated to a random selection of Orari Gorge Station commercial Romney ewes. This progeny trial was carried out under Agresearch guide lines to maximise the relevance of the data collected. 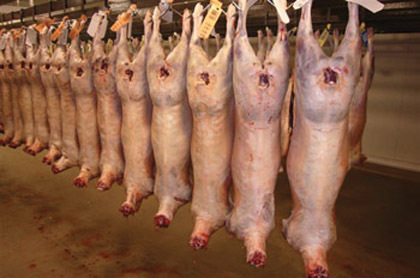 To fit in with Alliance and Agresearch, the heaviest half of the male lambs (regardless of actual weight or condition) were killed in January through the Alliance Smithfield plant with VIAscan. These Romney sired lambs from Romney ewes averaged over 57% meat yield and 96% met the meat yield grading threshold to qualify for the $6+ bonus. The 1st, 2nd and 4th ranked Romneys in the country ranked on the SIL ACE meat index trait leader list are all Orari Gorge Romneys.